Meizu has recently launched two unique smartphones named the Meizu Pro 7, and Pro 7 Plus that come with a secondary display on the back side which can be used for a lot of tasks as it is not an E-ink display like the YotaPhone. But, if we believe GFXbench, it seems there is still one more member of the Pro 7 family that is launching soon. 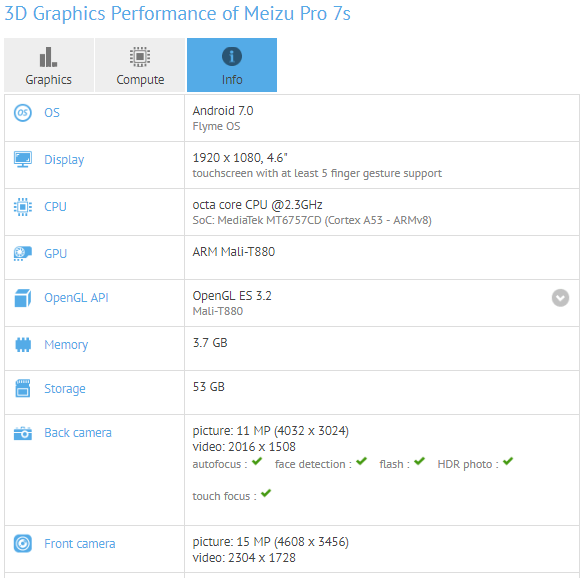 Today, the Meizu Pro 7s showed up on GFXBench that revealed some of the specifications of the phone, and there is not much difference in the specs of Pro 7s and Pro 7. IS THERE A MEIZU PRO 7S LAUNCHING SOON? Talking about the specifications, GFXBenh listing reveals a smaller 4.6-inch Full-HD Display on the Meizu Pro 7s as compared to the 5.2-inch display of the Pro 7. There is a 2.3GHz Octa-Core MediaTek MT6757D (Helio P25) processor with 4GB RAM and 64GB internal storage. It is a processor that is manufactured via the 16nm process. The Pro 7s has the same ARM Mali-T880 GPU. There is 12MP rear camera listed on GFXBench and a 16MP front-facing camera. Unlike the Pro 7, there is no NFC support on the Pro 7s. Well, it is hard to tell if any Meizu Pro 7s is launching in coming months so let’s wait for some more details about the smartphone. Stay Tuned.